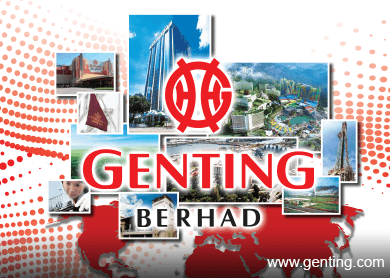 KUALA LUMPUR (May 13): Shares in Genting Bhd jumped as much as 26 sen or about 3% after Affin Hwang Capital Research said its subsidiary Genting Singapore PLC (GENS) may likely see a sequential pick up in the first quarter financial year 2015 (1Q15) earnings. At 10.40am, shares in the diversified group were traded at RM8.93, gained 21 sen or 2.4% with some 1.2 million shares changed hands. With the current price, it has a market capitalisation of RM32.42 billion. The stock was traded in the green today, between the range of RM8.80 and RM8.98. It was the third largest gainer across the bourse. Trading of Genting Bhd's (fundamental: 2.1; valuation: 0.8) shares has been very volatile over the past year. It had risen to a high of RM10.20 on June 10 last year before dipping to a low of RM8.14 on March 11 this year. In a note to client today, Affin Hwang DBS Research believed GENS may likely see a sequential pick up in 1Q15 earnings on potentially better volumes and normalised improvement in luck factor. "There are potential recovery signs based on Marina Bay Sands' (MBS) 1Q15 results but stay cautious due to lack of visible traction in demand growth," Affin Hwang said. It said MBS' relatively stable set of results is positive for GENS, which is due to announce its 1Q15 results tomorrow (May 14). "The continued growth in VIP volume in MBS suggests that volumes may have reached the bottom. "Also, we believe GENS may see a recovery in VIP hold rate in 1Q15. Similar to MBS in the mass market, GENS has been increasing efforts to bring in mass volume growth," it added. Affin Hwang said volume growth for GENS may be felt more acutely in second quarter 2015 (2Q15) since Resorts World Sentosa (RWS) is expected to boost its hotel capacity with the soft opening of the 557-room Genting Hotel Jurong on April 30. "There is a complimentary 24-hour shuttle bus that runs continually between Genting Hotel Jurong and RWS," it added. The firm has maintained its Hold call with unchanged target price of RM9.25 on Genting.